Kevin Systrom, CEO and co-founder of Instagram, prepares for an announcement about IGTV in San Francisco, June 19, 2018. When Kevin Systrom and Mike Krieger sold Instagram to Facebook in 2012, the photo-sharing startup’s fiercely loyal fans worried about what would happen to their beloved app under the social media giant's wings. Instagram had just 31 million users when Facebook snapped it up for $1 billion; now it has a billion. It had no ads back then; it now features both display and video ads, although they're still restrained compared to Facebook. But that could quickly change. Facebook’s growth has started to slow, and Wall Street has been pushing the company to find new ways to increase revenue. As such, he thinks Facebook would be wise to reassure users that what they love about Instagram isn't going to change — that they are not going to be forced to integrate with Facebook. “That'll go a long way,” he said. FILE - WhatsApp co-founder and CEO Jan Koum speaks during a conference at the Mobile World Congress, in Barcelona, Spain, Feb. 24, 2014. Internally, the challenge is a bit more complicated. While Systrom and Krieger didn’t say why they’re leaving, their decision echoes the recent departure of WhatsApp's co-founder and CEO Jan Koum, who resigned in April. 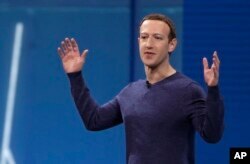 Koum had signaled years earlier that he would take a stand if Facebook's push to increase profits risked compromising core elements of the WhatsApp messaging service, such as its dedication to user privacy. When Facebook started pushing harder for more revenue and more integration with WhatsApp, Koum pulled the ripcord. One sign that additional integration may be in Instagram's future: Zuckerberg in May sent longtime Facebook executive Adam Mosseri to run Instagram’s product operation. Mosseri replaced longtime Instagrammer Kevin Weil, who was shuffled back to the Facebook mothership.